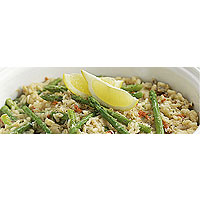 Combine fresh asparagus with dressed Cromer crab in this colourful and delicious risotto, made with dry white wine. Place the stock in a pan and bring to the boil. Remove any woody ends from the asparagus (see Cook's tips). Add the asparagus spears to the stock and cook for 4-5 minutes, until just tender. Remove with a slotted spoon and keep warm. Remove the stock from the heat. Spray the base of a medium saucepan with the olive oil then add the onion and fry, stirring, for 2-3 minutes. Add the rice and cook for a further 2 minutes. Pour in the wine and continue cooking until the liquid is absorbed. Add a ladleful of stock to the rice and stir until absorbed. Continue adding the stock in this way, stirring occasionally, until the rice is tender and most of the liquid has been absorbed. (This should take about 15 minutes in total). Finally, add the cooked asparagus, reserving a few spears to place on top of the dish, and stir in the crab meat. Cook for a further 1-2 minutes until heated through. Season to taste, top with the extra spears, then serve immediately, garnished with parsley and lemon wedges.